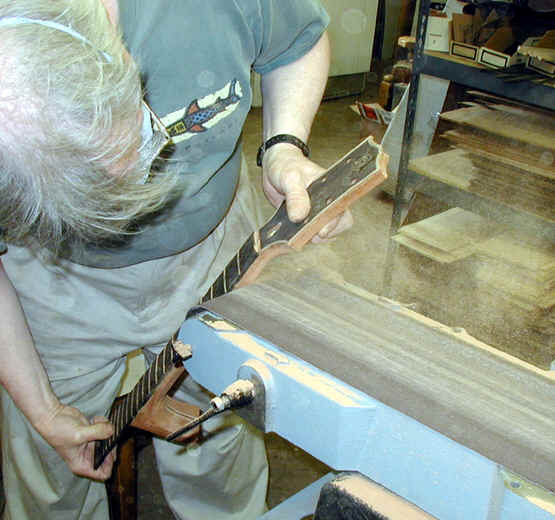 I do a great deal of the shaping of my necks on the end of my belt sander. 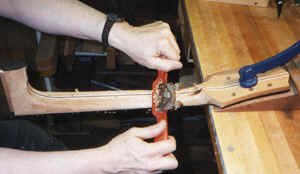 I find that it is a very quick and easy way to remove a lot of excess wood and with a little practice, I can get certain parts of the neck very close to final shape. 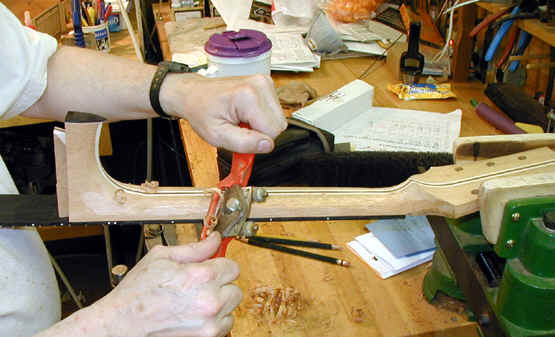 I use this template to lay out the basic shape of the volute before I carve it. 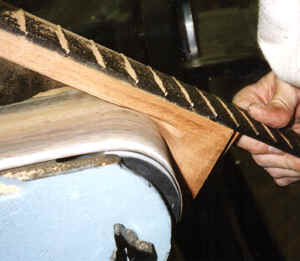 One area which is ideal for shaping on the belt sander is the curve from the end of the fingerboard to the peghead. 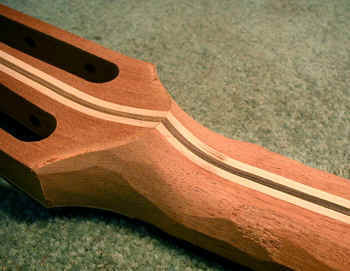 Although it is not visible in this photo, I draw a line on the peghead which is parallel to the end of the fingerboard and at the point where the sides of the peghead will begin to curve into the fingerboard. Then I just sand a curve to join these two points. It only takes a few seconds. 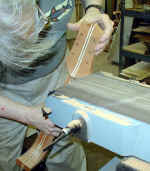 Here I am working on the heel of the neck. 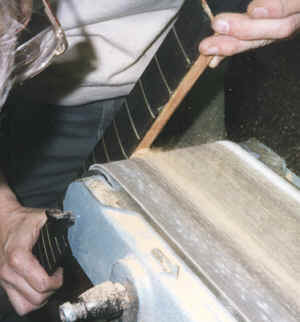 This is another ideal area for the sander. 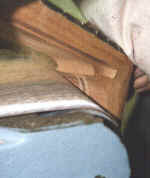 It is entirely end grain wood and this is the hardest part of the neck to carve with a drawknife or a spokeshave. I have done this enough to be able to get the shape very close to final shape and to require only touch up with a fine rasp (and hand sanding) to complete. More work on the heel. 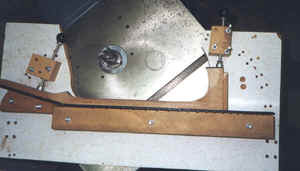 This is a jig which I use with my spindle shaper. 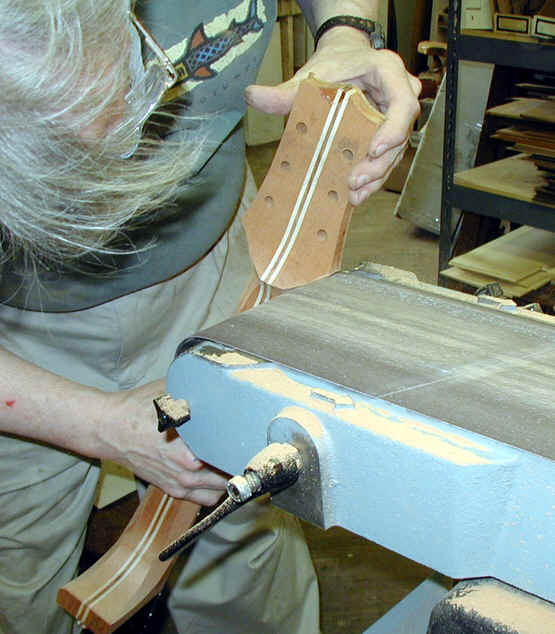 It is designed to cut the neck (with fingerboard attached) to the exact thickness. 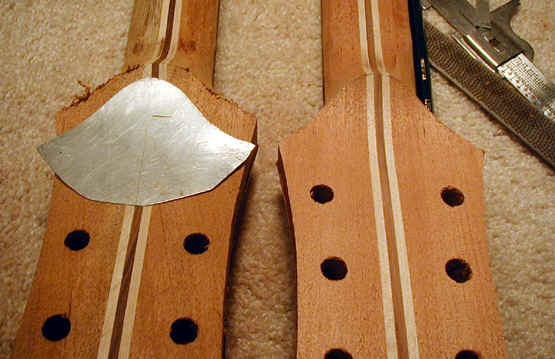 Getting the thickness (depth) of a neck exactly correct is critical and difficult. This jig materially eases the job. I think the photo is self-explanatory. 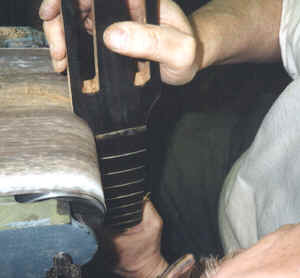 Here, after establishing the basic thickness of the neck (see prior photo) I begin shaping the contour of the neck with a spokeshave. 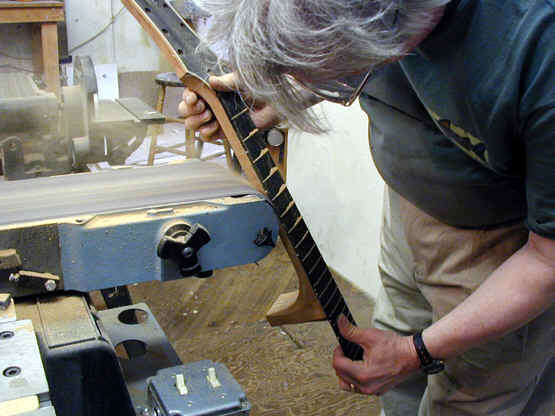 From time to time I have thought of doing this with some sort of automatic carving machine (a pantograph device with a router) and have decided that in fact this is one of the parts of guitar building that I enjoy doing by hand - it is very tactile. So, I continue to do it by hand. I am not convinced that my way is better - it almost certainly isn't, but I like it. 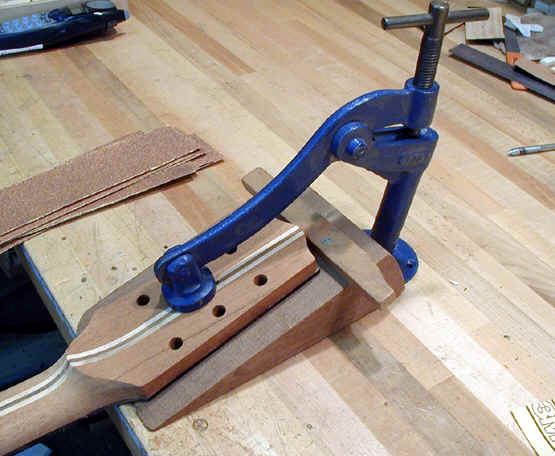 This clamp works well for holding the neck while using the spokeshave or sanding the neck. 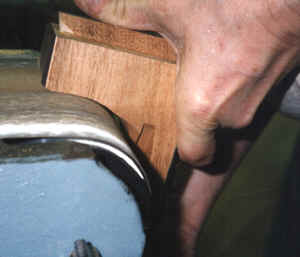 This shows the peghead end of the neck, and all of the shaping to this point is done on the end of the sander. At this point I will start using a file to fine tune the shape, followed by hand sanding to finish the shape and prepare it for finishing. I use this mini-orbital air powered sander for some of the shaping/sanding on my necks. The nose is quite soft foam and conforms to the complex shapes of the neck. For bare wood it works well to smooth surfaces which have been finished with a rasp, and after the finishing has begun it works well to smooth the initial coats of lacquer. Here I am using it on the heel of a neck.